Amazon has planned to increase FBA fees for storage at Amazon warehouses. * Monthly Inventory Storage Fees: Starting April 1, 2018, will be increased by $ 0.05 per cubic foot. A relatively small change (8%), which, however, must be taken into account by some sellers with large inventory volumes. * Long-Term Storage Fees: Starting from September 15, 2018, the rates will be adjusted, as well as the assessment dates will be made not once per six months, but monthly (which will force sellers to get rid of products in long-term storage). This is one of the main changes that can significantly affect sellers, due to the fact that the size of the fee for products more than 6 months in storage will almost double. 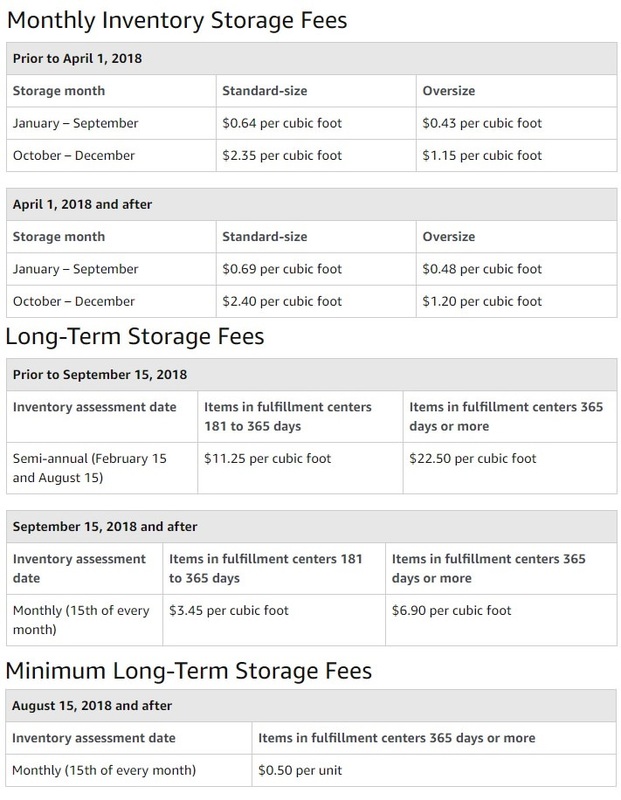 * Minimum Long-Term Storage Fees: Starting from August 15, 2018, a new fee is introduced – $ 0.50 per cubic foot per month for items in fulfillment centers for 365 days or more. Of the last two fees, the seller will be charged with the one that has a bigger amount. sellerboard taking into account all new amazon fee rates automatically.